The present invention provides targeted protein cages for the specific delivery of a variety of agents to cells and tissues and methods of use. 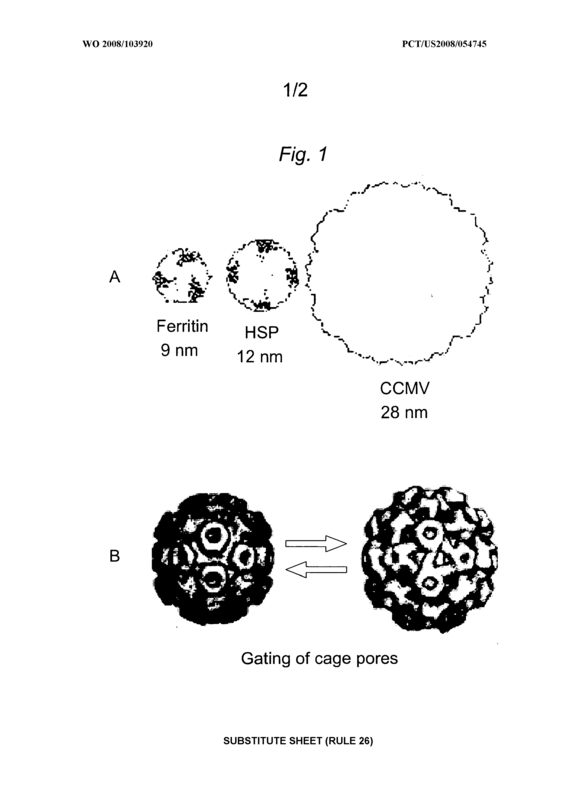 The targeted protein cages have exterior targeting moieties and therapeutic or imaging agents which are encapsulated within the protein cages or are located on the exterior surfaces of the protein cages. 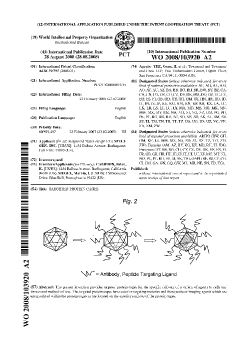 A proteinaceous composition, said proteinaceous composition comprising: a protein cage having a targeting moiety; and a payload encapsulated within said protein cage. 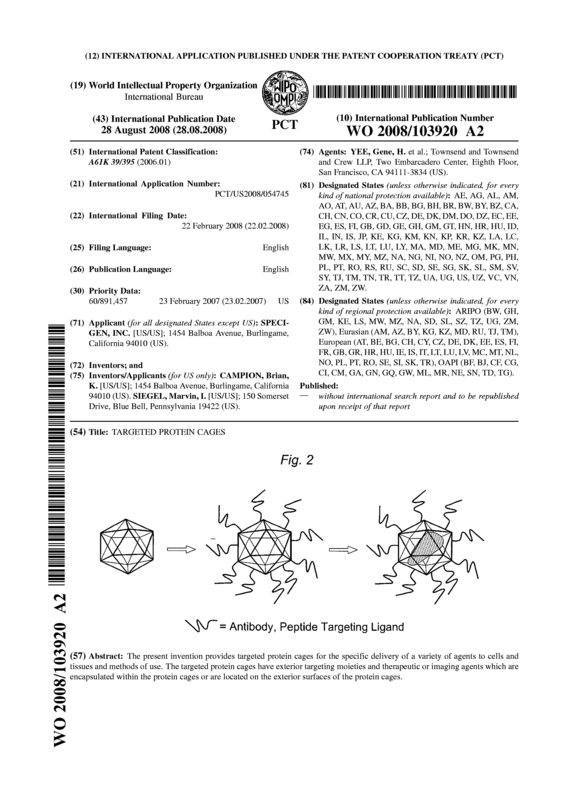 The composition of claim 1, wherein said targeting moiety is selected from the group consisting of an antibody, a ligand for a receptor, a carbohydrate, a lipid, and a polynucleotide. 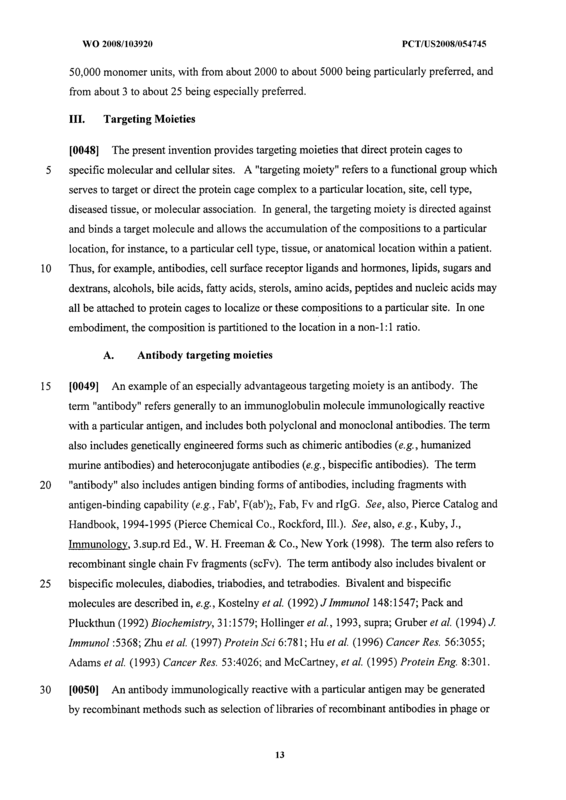 The composition of claim 2, wherein said targeting moiety comprises an antibody or fragment thereof. 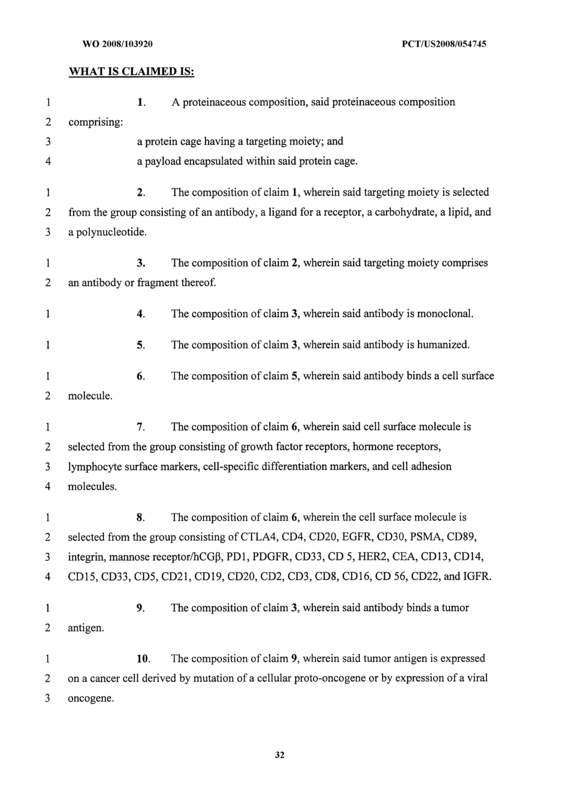 The composition of claim 3, wherein said antibody is monoclonal. 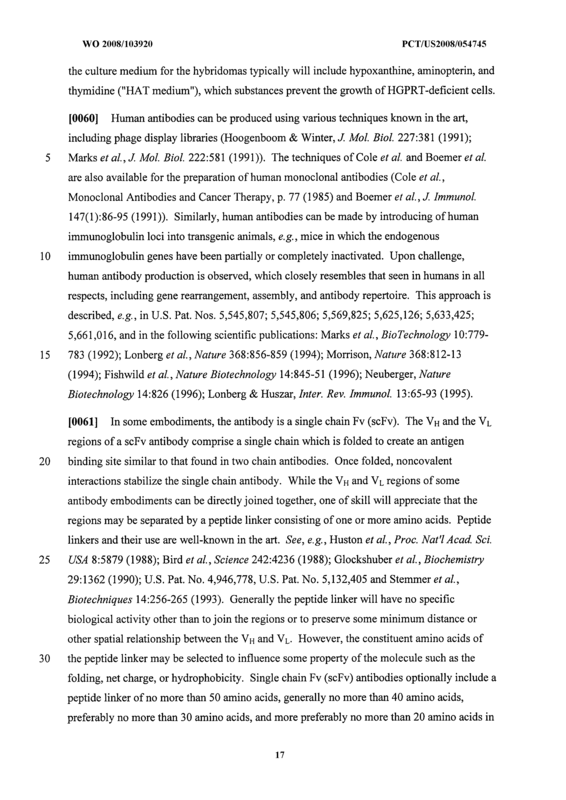 The composition of claim 3, wherein said antibody is humanized. 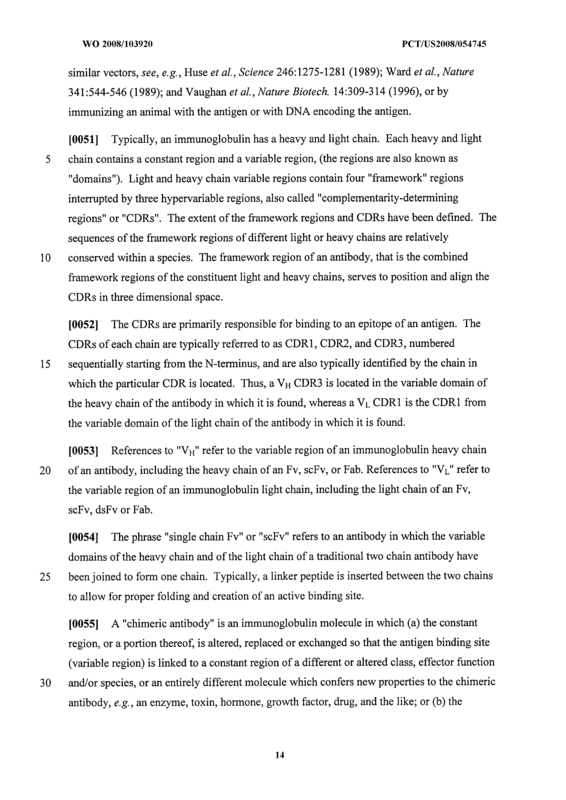 The composition of claim 5, wherein said antibody binds a cell surface molecule. 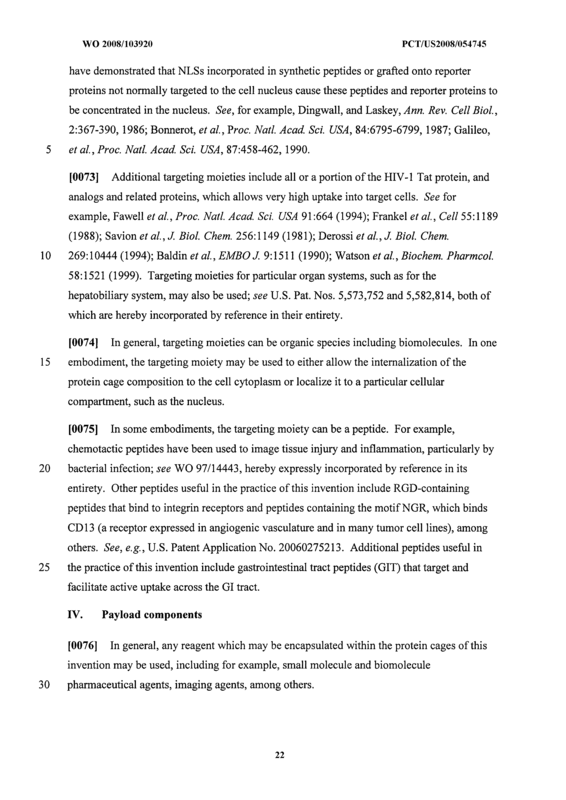 The composition of claim 6, wherein said cell surface molecule is selected from the group consisting of growth factor receptors, hormone receptors, lymphocyte surface markers, cell-specific differentiation markers, and cell adhesion molecules. 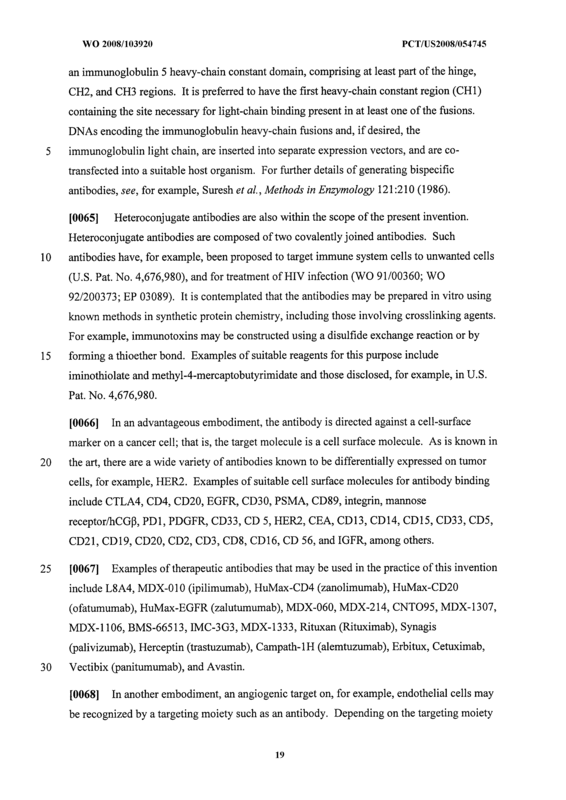 The composition of claim 6, wherein the cell surface molecule is selected from the group consisting of CTLA4, CD4, CD20, EGFR, CD30, PSMA, CD89, integrin, mannose receptor/hCGβ, PDl, PDGFR, CD33, CD 5, HER2, CEA, CD 13, CD 14, CD15, CD33, CD5, CD21, CD19, CD20, CD2, CD3, CD8, CD16, CD 56, CD22, and IGFR. The composition of claim 3, wherein said antibody binds a tumor antigen. The composition of claim 9, wherein said tumor antigen is expressed on a cancer cell derived by mutation of a cellular proto-oncogene or by expression of a viral oncogene. 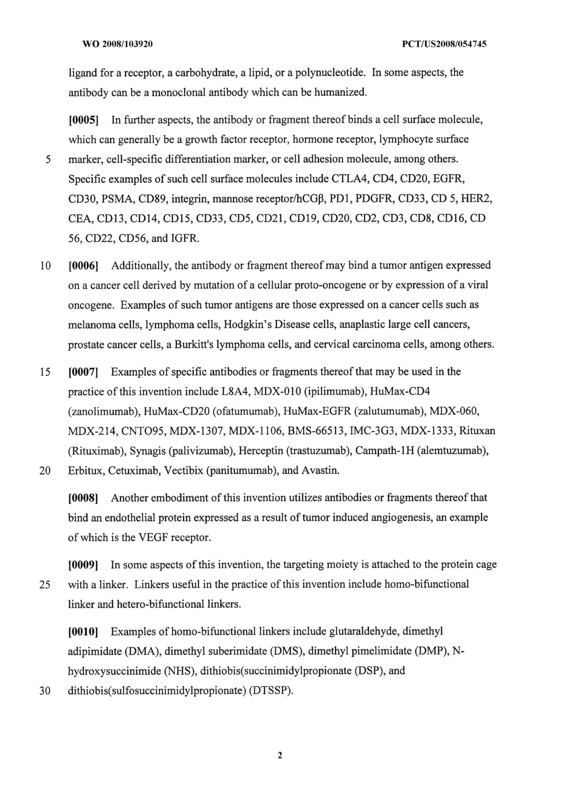 The composition of claim 9, wherein said tumor antigen is expressed on a cancer cell selected from the group consisting of a melanoma cell, a lymphoma cell, a Hodgkin's Disease cell, an anaplastic large cell cancer, a prostate cancer cell, a Burkitt's lymphoma cell, and a cervical carcinoma cell. The composition of claim 3, wherein said antibody is selected from the group consisting of L8A4, MDX-OlO (ipilimumab), HuMax-CD4 (zanolimumab), HuMax- CD20 (ofatumumab), HuMax-EGFR (zalutumumab), MDX-060, MDX-214, CNTO95, MDX-1307, MDX-1106, BMS-66513, IMC-3G3, MDX-1333, Rituxan (Rituximab), Synagis (palivizumab), Herceptin (trastuzumab), Campath-1H (alemtuzumab), Erbitux, Cetuximab, Vectibix (panitumumab), and Avastin. The composition of claim 3, wherein said antibody binds an endothelial protein expressed as a result of tumor induced angiogenesis. The composition of claim 13, wherein said endothelial protein is the VEGF receptor. 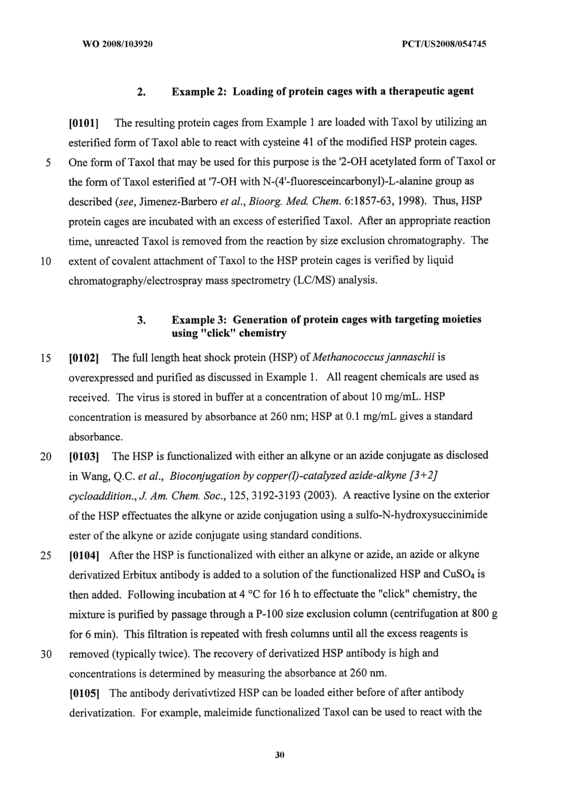 The composition of claim 1, wherein said targeting moiety is attached to the protein cage with a linker. The composition of claim 15, wherein said linker is a homo- bifunctional linker. 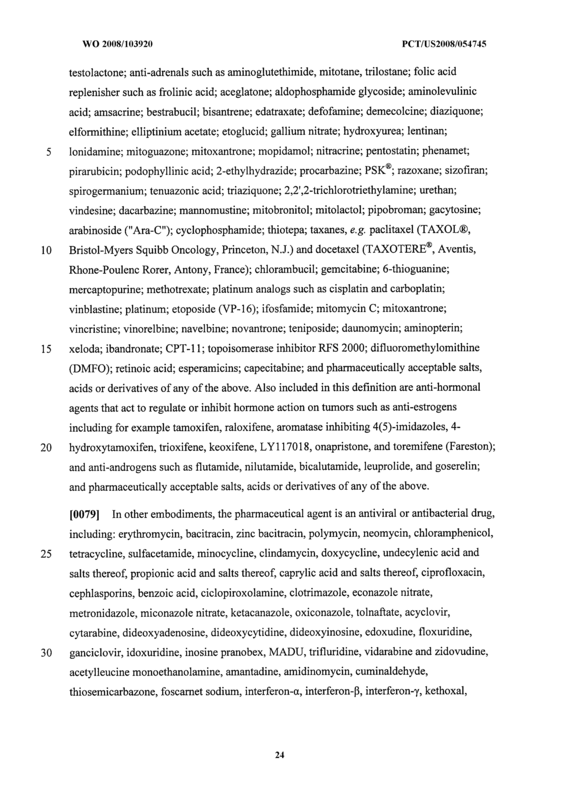 The composition of claim 16, wherein said homo-bifunctional linker is selected from the group consisting of glutaraldehyde, dimethyl adipimidate (DMA), dimethyl suberimidate (DMS), dimethyl pimelimidate (DMP), N-hydroxysuccinimide (NHS), dithiobis(succinimidylpropionate (DSP), and dithiobis(sulfosuccinimidylpropionate) (DTSSP). The composition of claim 15, wherein said linker is hetero-bifunctional linker. The composition of claim 18, wherein said hetero-bifunctional linker has a N-hydroxysuccinimide (NHS) at a first end and a free -SH at a second end. The composition of claim 19, wherein said hetero-bifunctional linker is [succinimidyl 3-(2-pyridyldithio)propionate](SPDP) or [succinimidyl trans-4- (maleimidylmethyl)cyclohexane-l-carboxylate](SMCC). 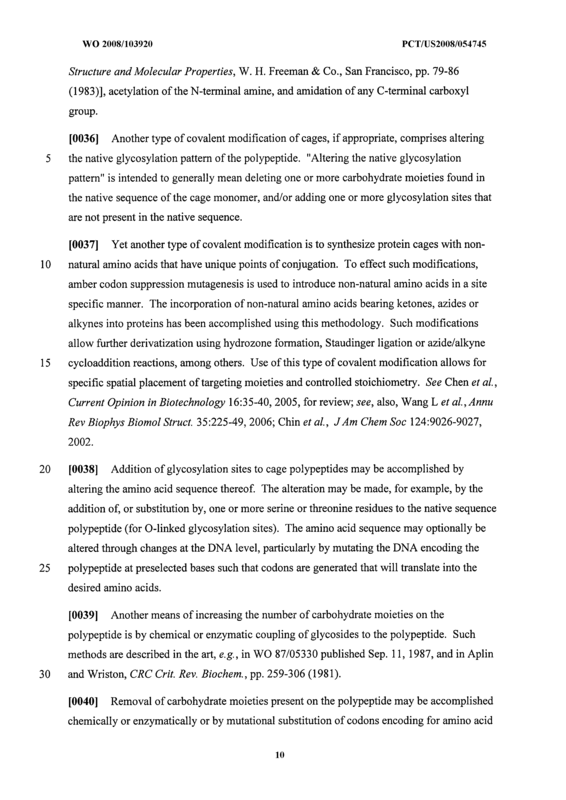 The composition of claim 15, wherein said linker is selected from the group consisting of a polymer, peptide, carbohydrate, lipid, and nucleic acid. The composition of claim 15, wherein said linker is cleavable. 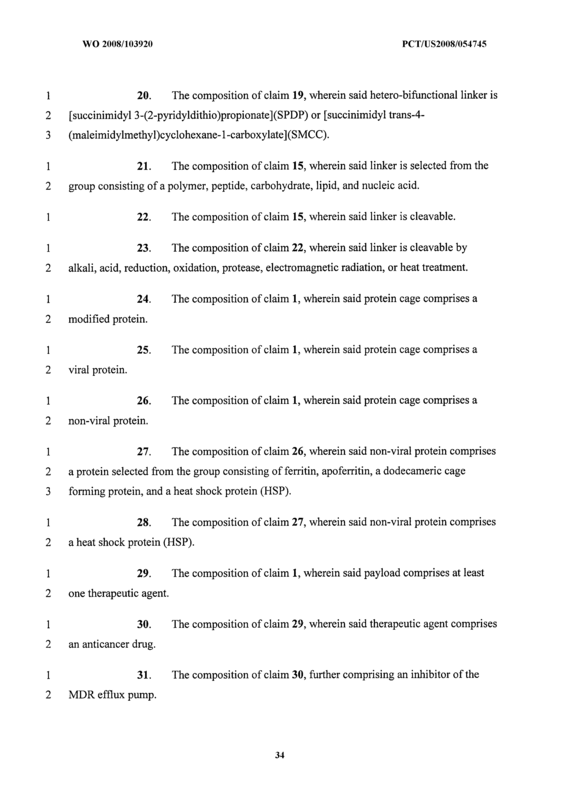 The composition of claim 22, wherein said linker is cleavable by alkali, acid, reduction, oxidation, protease, electromagnetic radiation, or heat treatment. 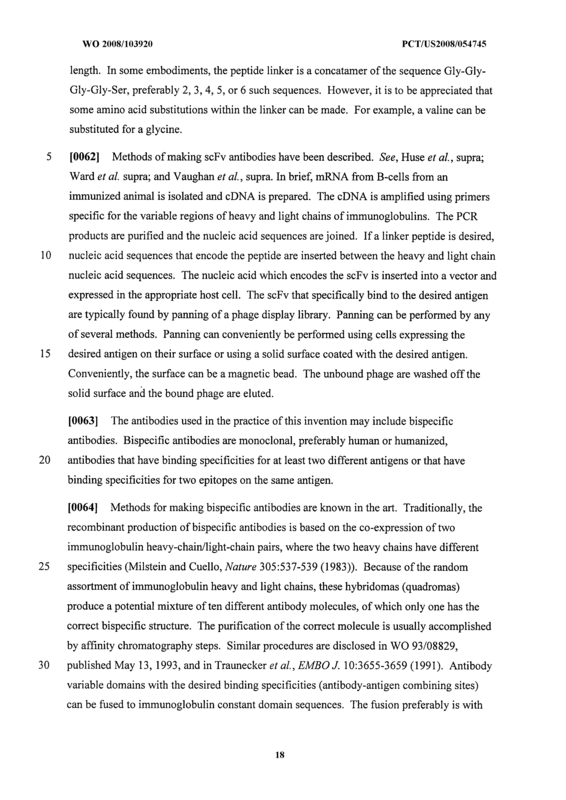 The composition of claim 1, wherein said protein cage comprises a modified protein. 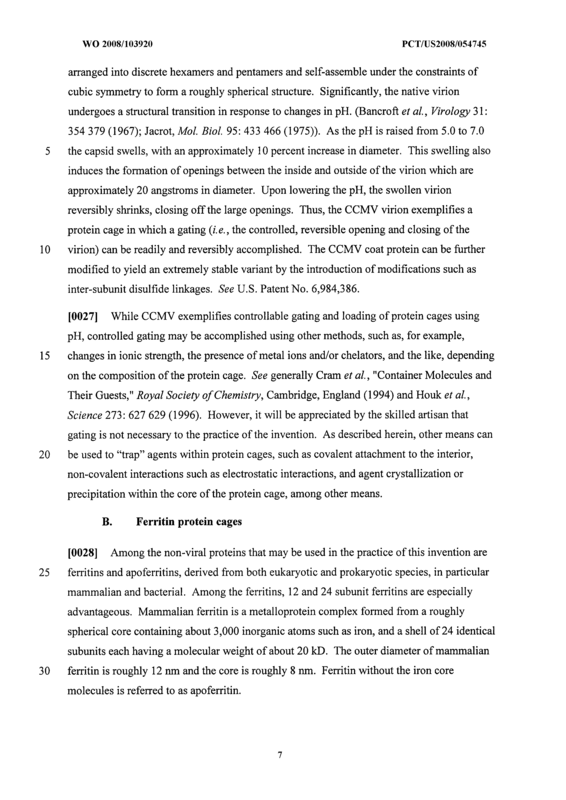 The composition of claim 1, wherein said protein cage comprises a viral protein. 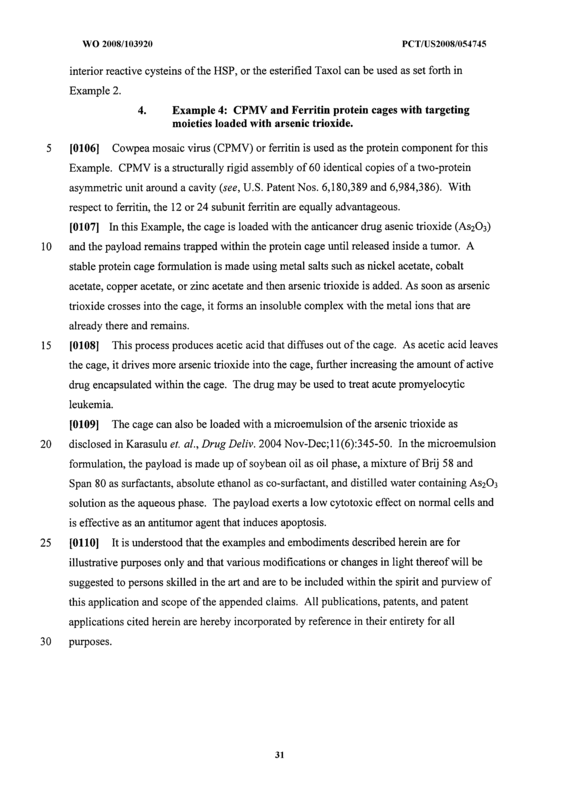 The composition of claim 1, wherein said protein cage comprises a non-viral protein. 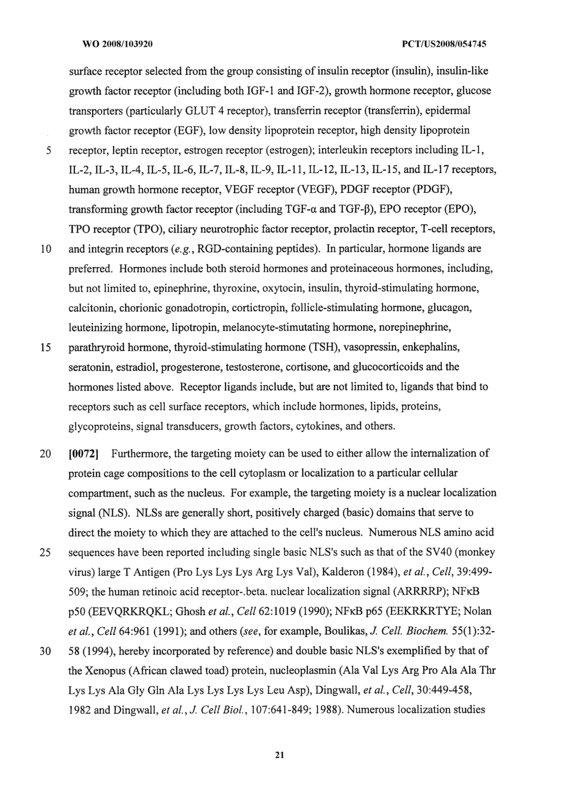 The composition of claim 26, wherein said non- viral protein comprises a protein selected from the group consisting of ferritin, apoferritin, a dodecameric cage forming protein, and a heat shock protein (HSP). 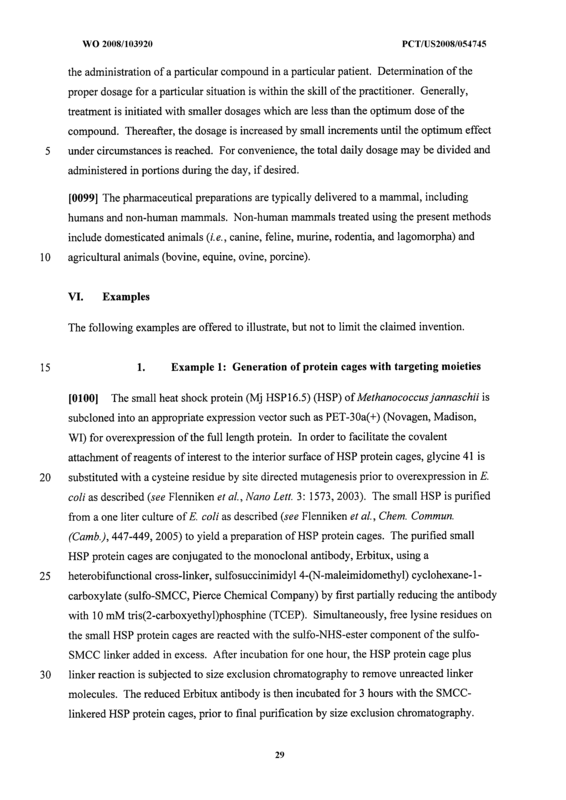 The composition of claim 27, wherein said non- viral protein comprises a heat shock protein (HSP). 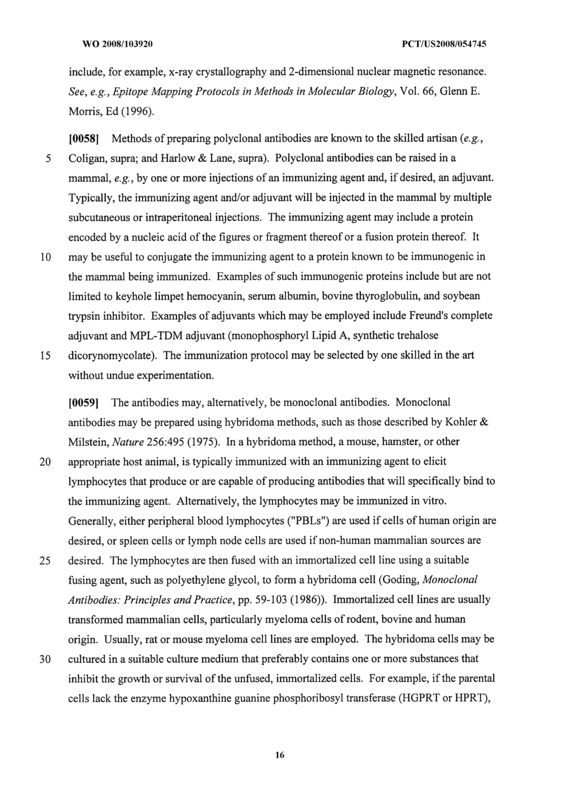 The composition of claim 1, wherein said payload comprises at least one therapeutic agent. 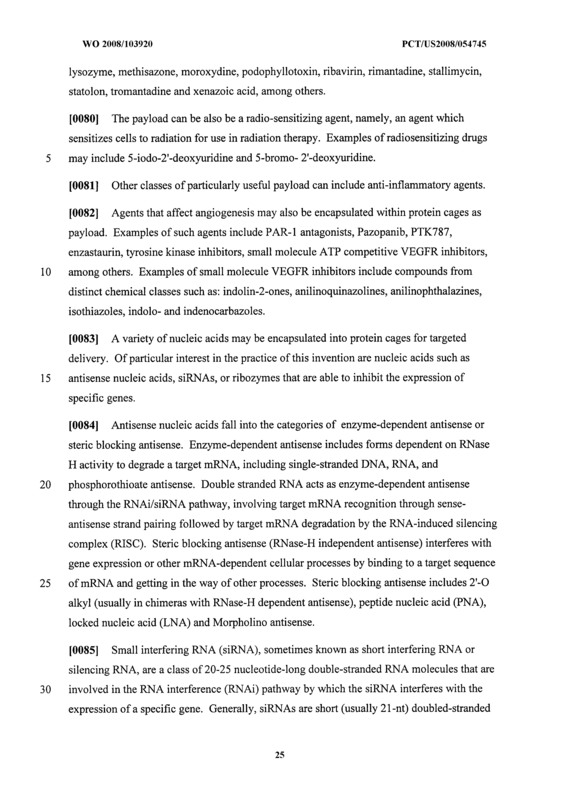 The composition of claim 29, wherein said therapeutic agent comprises an anticancer drug. The composition of claim 30, further comprising an inhibitor of the MDR efflux pump. 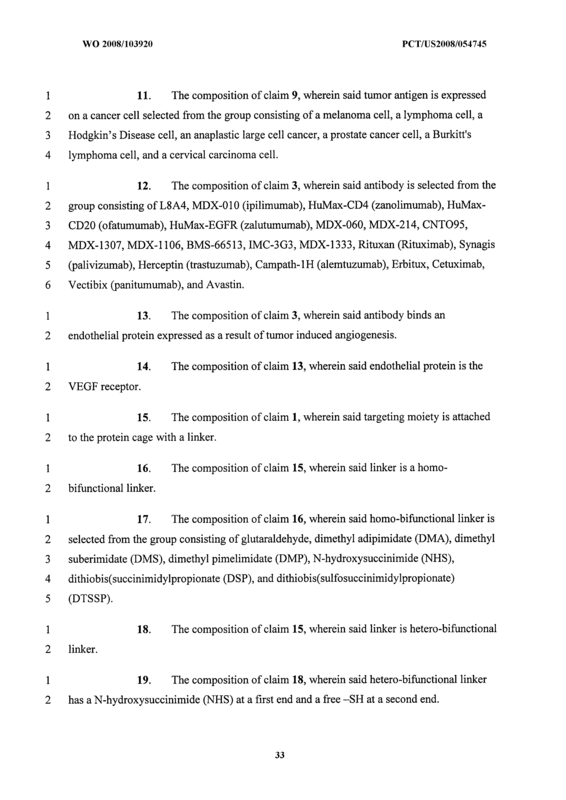 The composition of claim 30, wherein said anticancer drug is selected from the group consisting of doxorubicin, daunorubicin, idarubicin, aclarubicin, zorubicin, mitoxantrone, epirubicin, carubicin, nogalamycin, menogaril, pitarubicin, valrubicin, cytarabine, gemcitabine, trifluridine, ancitabine, enocitabine, azacitidine, doxifluridine, pentostatin, broxuridine, capecitabine, cladribine, decitabine, floxuridine, fludarabine, gougerotin, puromycin, tegafur, tiazofurin, adriamycin, cisplatin, carboplatin, cyclophosphamide, dacarbazine, vinblastine, vincristine, mitoxantrone, bleomycin, mechlorethamine, prednisone, procarbazine methotrexate, flurouracils, etoposide, taxol, taxol analogs, and mitomycin. 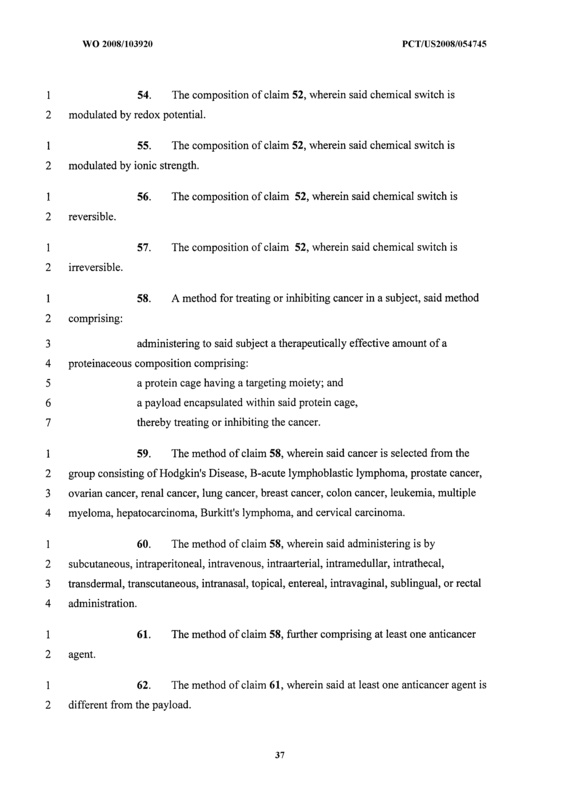 The composition of claim 30, wherein said anticancer drug is a hypertoxic agent. 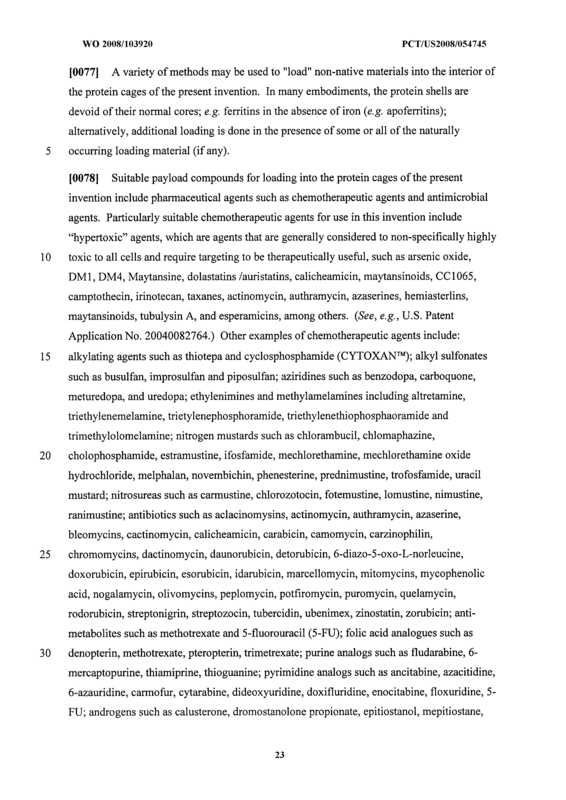 The composition of claim 33, wherein the hypertoxic agent is selected from the group consisting of arsenic oxide, DMl , DM4, Maytansine, dolastatins /auristatins, calicheamicin, maytansinoids, CC 1065, camptothecin, irinotecan, thiotepa, taxanes, actinomycin, authramycin, azaserines, hemiasterlins, maytansinoids, and esperamicins. 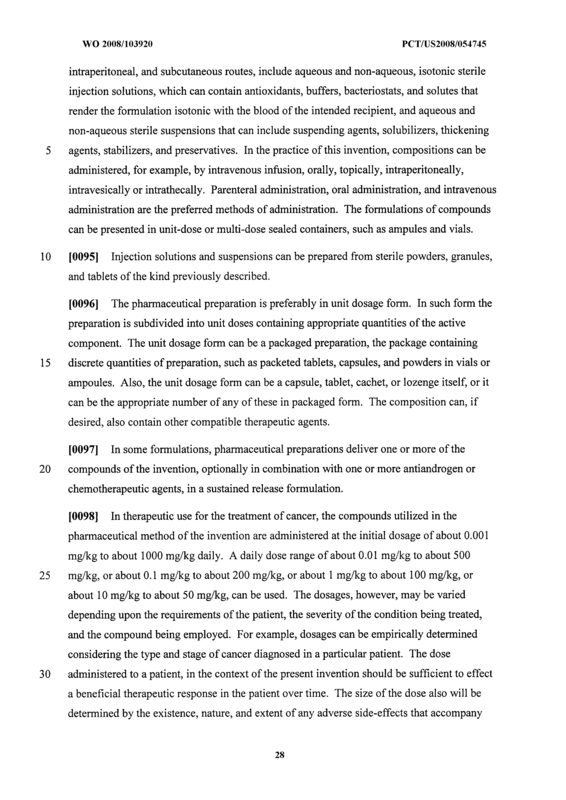 The composition of claim 30, wherein said anticancer drug is a radiotherapeutic agent. 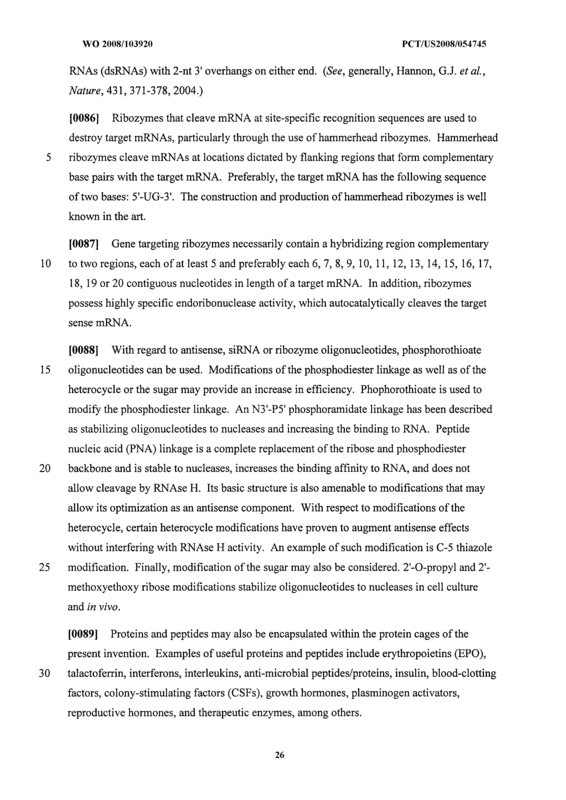 The composition of claim 1, wherein said payload comprises siRNA. The composition of claim 1, wherein said payload is crystalline. The composition of claim 1, wherein said payload is liquid. 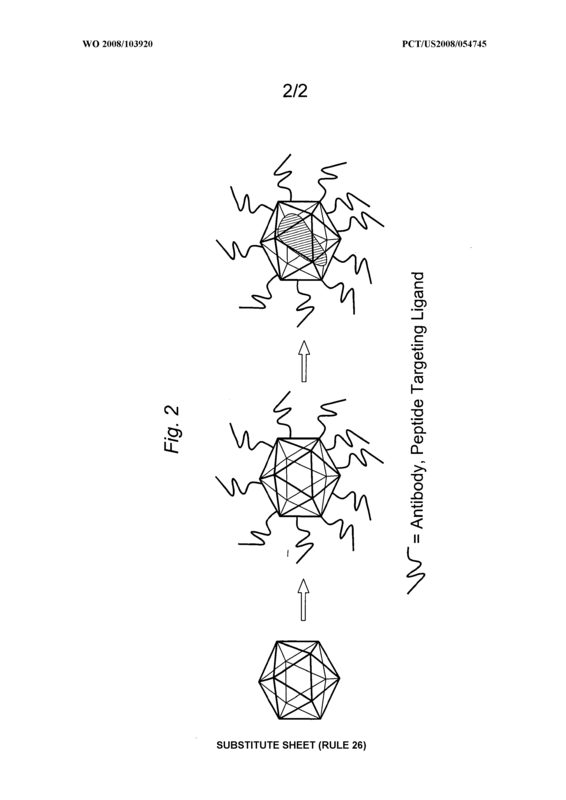 The composition of claim 1, wherein said payload is a nanoparticle. 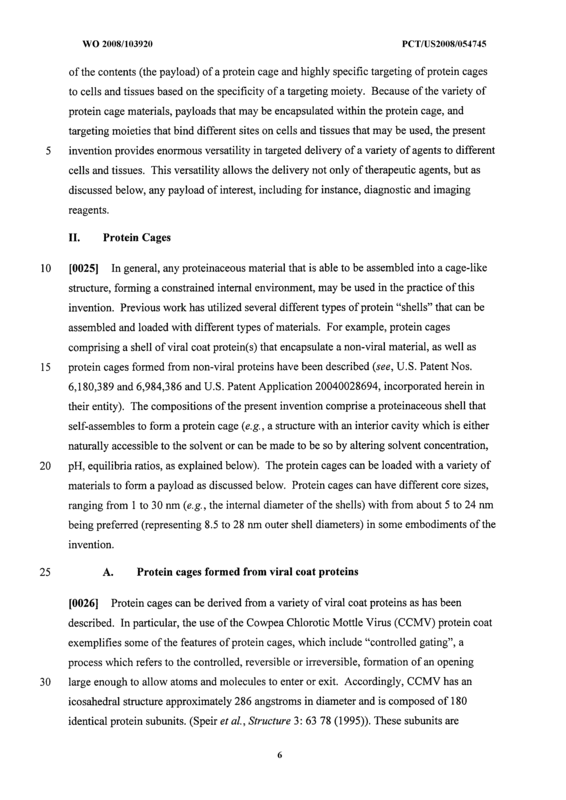 The composition of claim 1, wherein the payload is noncovalently associated with said protein cage. The composition of claim 40, wherein said noncovalent association is electrostatic. 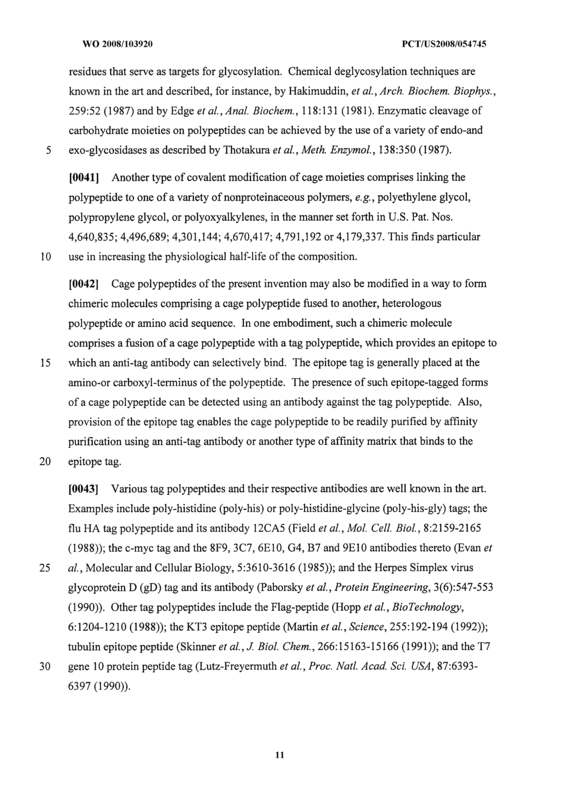 The composition of claim 1, wherein said payload is covalently attached to said protein cage. The composition of claim 42, wherein said attachment is direct or via a linker. 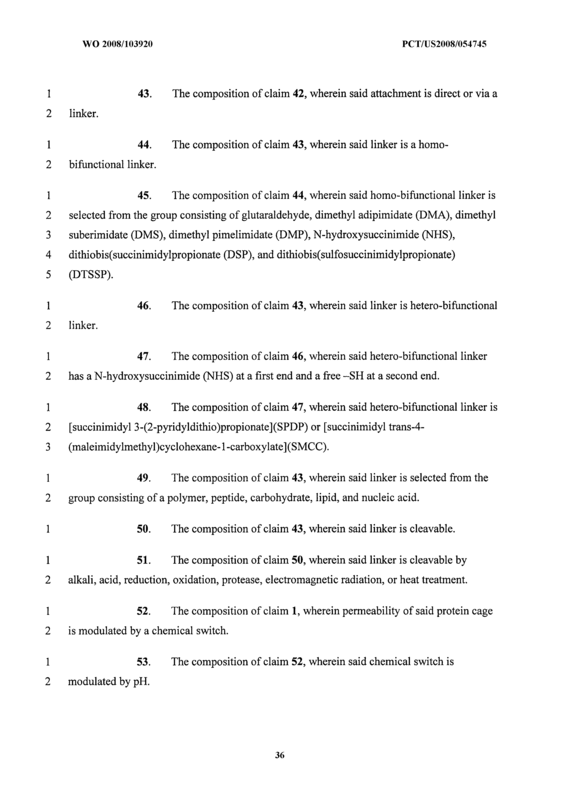 The composition of claim 43, wherein said linker is a homo- bifunctional linker. 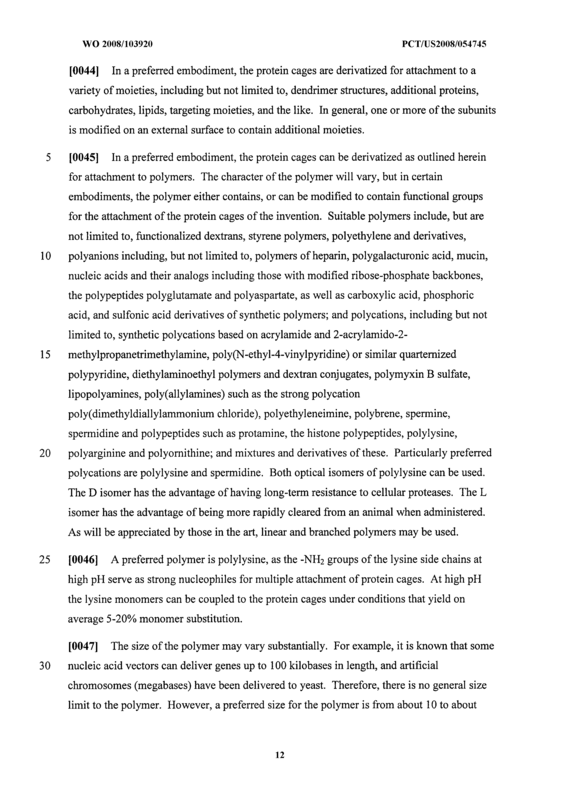 The composition of claim 44, wherein said homo-bifunctional linker is selected from the group consisting of glutaraldehyde, dimethyl adipimidate (DMA), dimethyl suberimidate (DMS), dimethyl pimelimidate (DMP), N-hydroxysuccinimide (NHS), dithiobis(succinimidylpropionate (DSP), and dithiobis(sulfosuccinimidylpropionate) (DTSSP). The composition of claim 43, wherein said linker is hetero-bifunctional linker. The composition of claim 46, wherein said hetero-bifunctional linker has a N-hydroxysuccinimide (NHS) at a first end and a free -SH at a second end. The composition of claim 47, wherein said hetero-bifunctional linker is [succinimidyl 3-(2-pyridyldithio)propionate](SPDP) or [succinimidyl trans-4- (maleimidylmethyl)cyclohexane- 1 -carboxylateJ(SMCC). 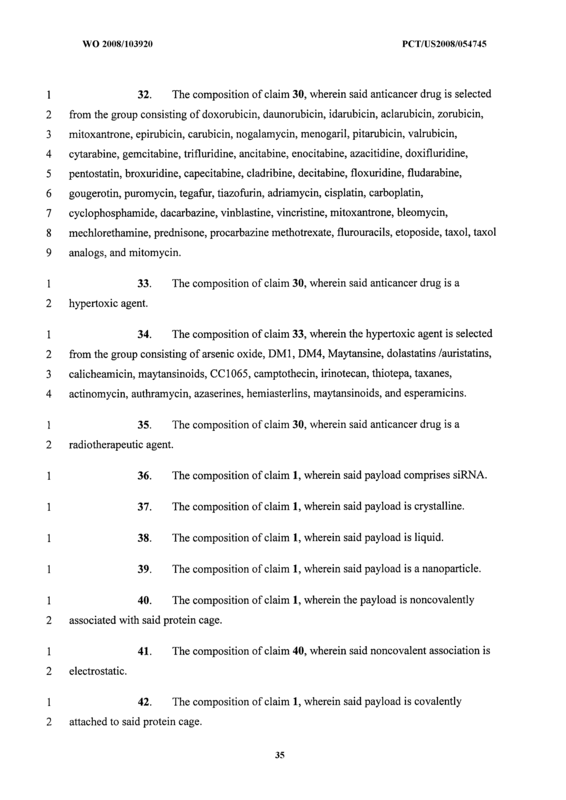 The composition of claim 43, wherein said linker is selected from the group consisting of a polymer, peptide, carbohydrate, lipid, and nucleic acid. The composition of claim 43, wherein said linker is cleavable. The composition of claim 50, wherein said linker is cleavable by alkali, acid, reduction, oxidation, protease, electromagnetic radiation, or heat treatment. The composition of claim 1, wherein permeability of said protein cage is modulated by a chemical switch. The composition of claim 52, wherein said chemical switch is modulated by pH. The composition of claim 52, wherein said chemical switch is modulated by redox potential. The composition of claim 52, wherein said chemical switch is modulated by ionic strength. The composition of claim 52, wherein said chemical switch is reversible. The composition of claim 52, wherein said chemical switch is irreversible. 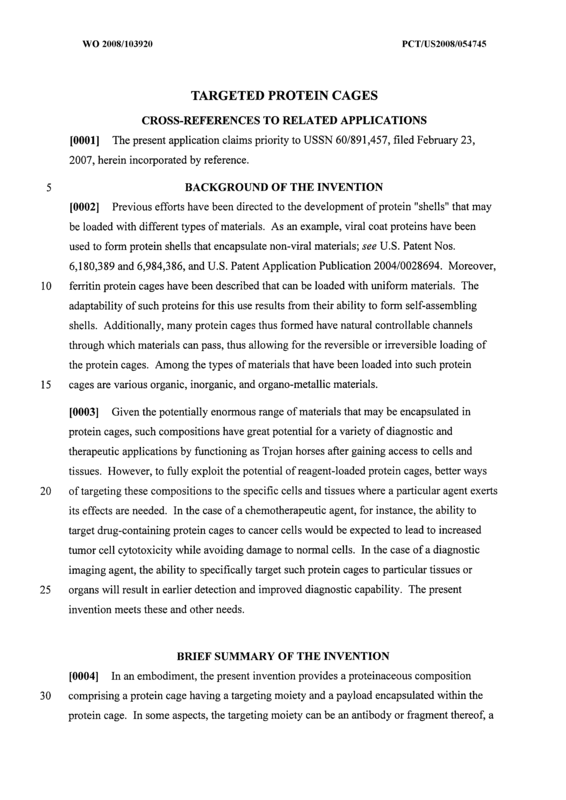 A method for treating or inhibiting cancer in a subject, said method comprising: administering to said subject a therapeutically effective amount of a proteinaceous composition comprising: a protein cage having a targeting moiety; and a payload encapsulated within said protein cage, thereby treating or inhibiting the cancer. 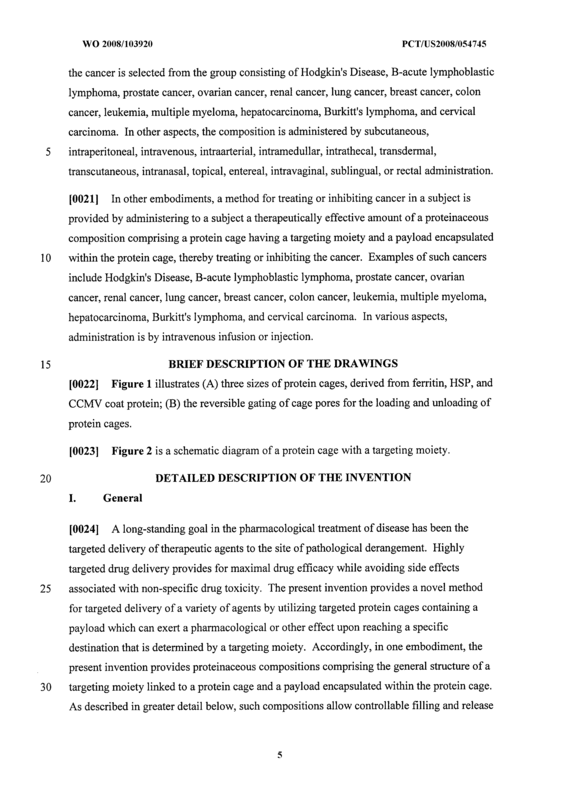 The method of claim 58, wherein said cancer is selected from the group consisting of Hodgkin's Disease, B-acute lymphoblastic lymphoma, prostate cancer, ovarian cancer, renal cancer, lung cancer, breast cancer, colon cancer, leukemia, multiple myeloma, hepatocarcinoma, Burkitt's lymphoma, and cervical carcinoma. The method of claim 58, wherein said administering is by subcutaneous, intraperitoneal, intravenous, intraarterial, intramedullar, intrathecal, transdermal, transcutaneous, intranasal, topical, entereal, intravaginal, sublingual, or rectal administration. 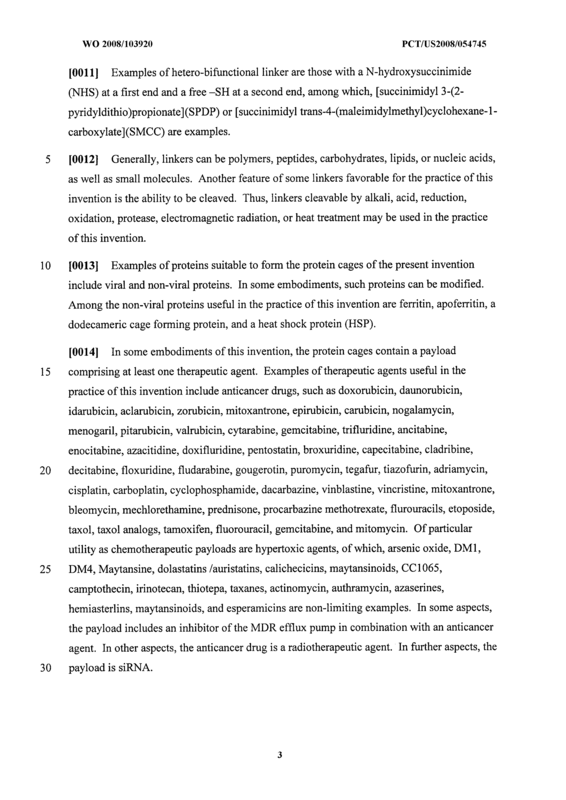 The method of claim 58, further comprising at least one anticancer agent. 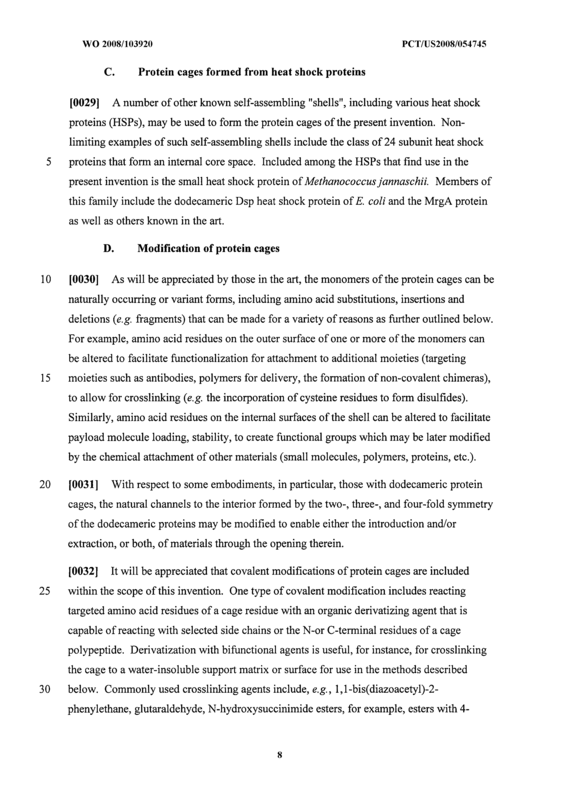 The method of claim 61, wherein said at least one anticancer agent is different from the payload. 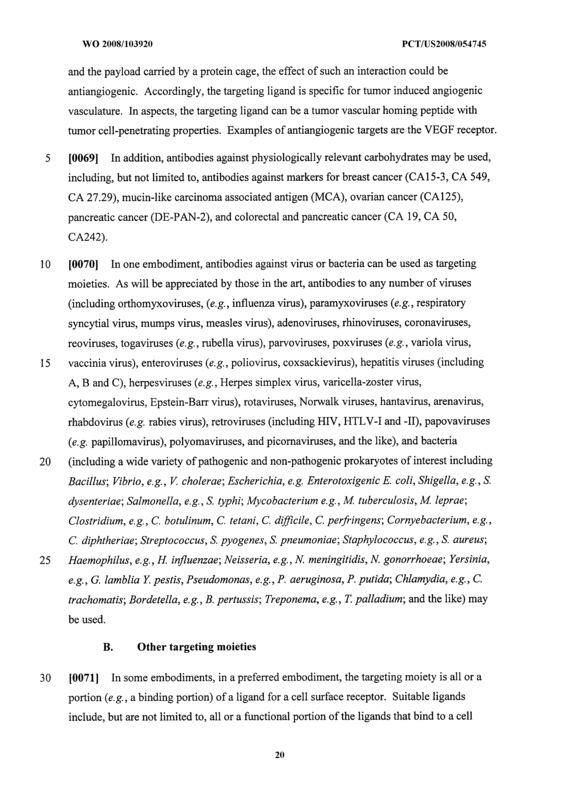 The method of claim 61, wherein said at least one anticancer agent is selected from the group consisting of doxorubicin, daunorubicin, idarubicin, aclarubicin, zorubicin, mitoxantrone, epirubicin, carubicin, nogalamycin, menogaril, pitarubicin, valrubicin, cytarabine, gemcitabine, trifluridine, ancitabine, enocitabine, azacitidine, doxifluridine, pentostatin, broxuridine, capecitabine, cladribine, decitabine, floxuridine, fludarabine, gougerotin, puromycin, tegafur, tiazofurin, adriamycin, cisplatin, carboplatin, cyclophosphamide, dacarbazine, vinblastine, vincristine, mitoxantrone, bleomycin, mechlorethamine, prednisone, procarbazine methotrexate, flurouracils, etoposide, taxol, taxol analogs, and mitomycin. 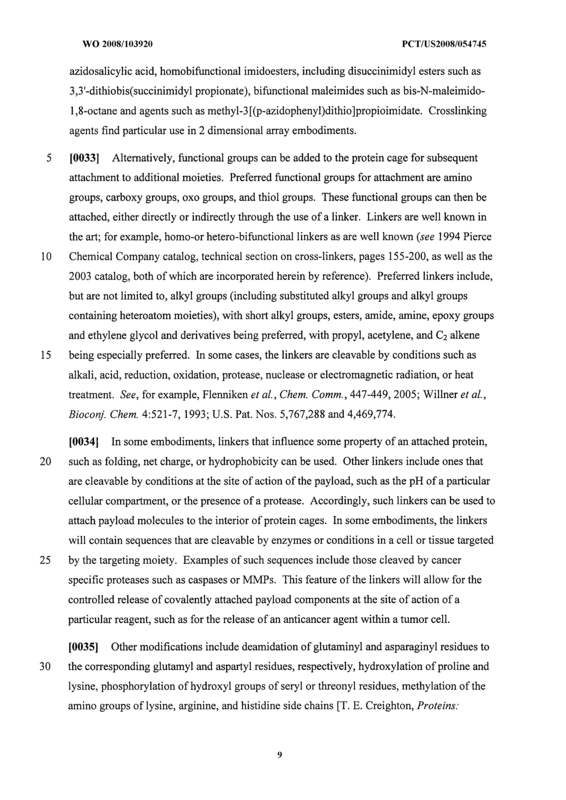 The proteinaceous composition of claims 1-57 for the treatment or prevention of cancer in a subject. 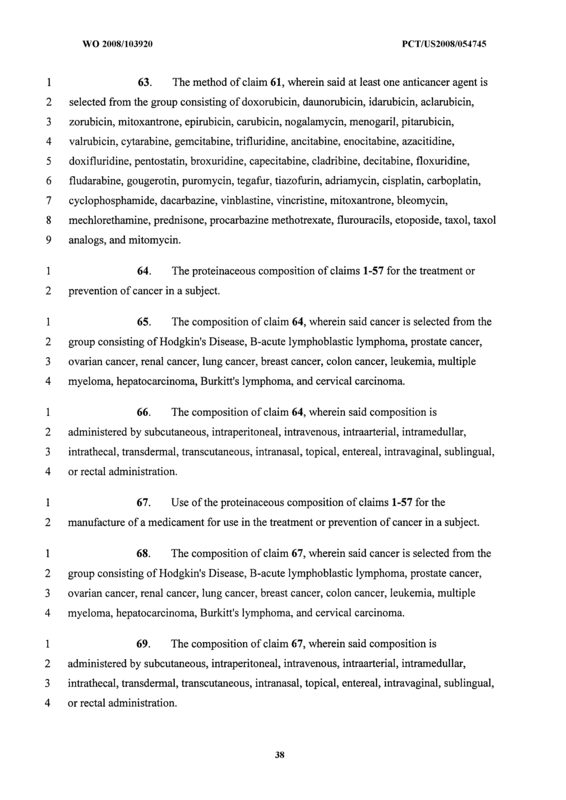 The composition of claim 64, wherein said cancer is selected from the group consisting of Hodgkin's Disease, B-acute lymphoblastic lymphoma, prostate cancer, ovarian cancer, renal cancer, lung cancer, breast cancer, colon cancer, leukemia, multiple myeloma, hepatocarcinoma, Burkitt's lymphoma, and cervical carcinoma. The composition of claim 64, wherein said composition is administered by subcutaneous, intraperitoneal, intravenous, intraarterial, intramedullar, intrathecal, transdermal, transcutaneous, intranasal, topical, entereal, intravaginal, sublingual, or rectal administration. 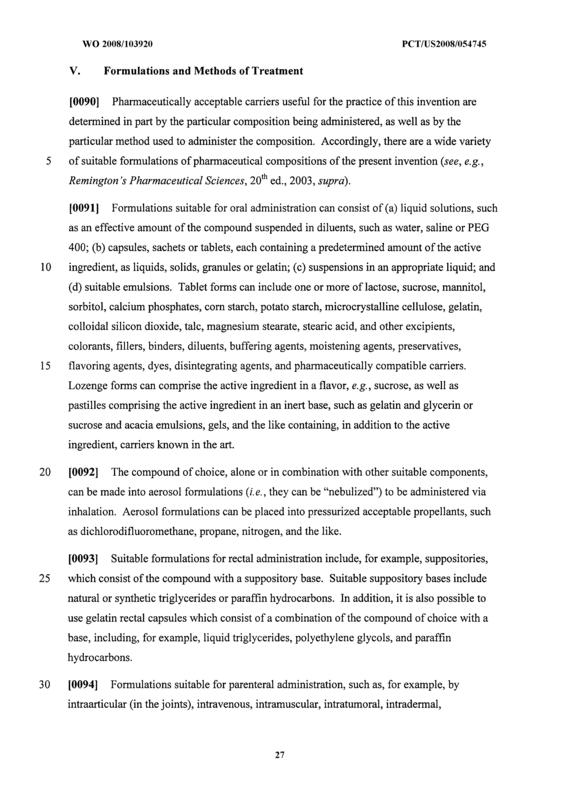 Use of the proteinaceous composition of claims 1-57 for the manufacture of a medicament for use in the treatment or prevention of cancer in a subject. 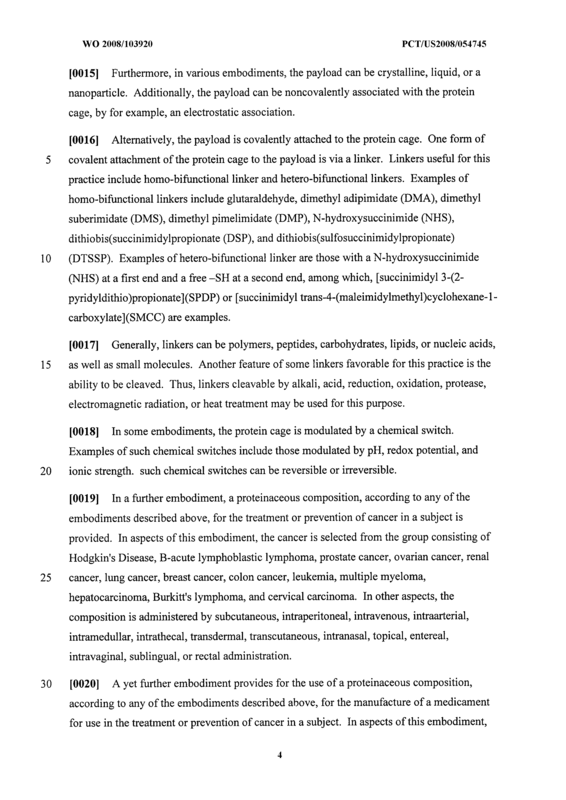 The composition of claim 67, wherein said cancer is selected from the group consisting of Hodgkin's Disease, B-acute lymphoblastic lymphoma, prostate cancer, ovarian cancer, renal cancer, lung cancer, breast cancer, colon cancer, leukemia, multiple myeloma, hepatocarcinoma, Burkitt's lymphoma, and cervical carcinoma. The composition of claim 67, wherein said composition is administered by subcutaneous, intraperitoneal, intravenous, intraarterial, intramedullar, intrathecal, transdermal, transcutaneous, intranasal, topical, entereal, intravaginal, sublingual, or rectal administration.